Many dentists do a great job explaining issues they find in patients’ mouths. However, it’s not always easy to understand or quantify the overall health of your mouth, especially when different priorities of treatment are recommended. That’s why we are introducing the Dental Score to translate difficult technical dental terms into an easy to understand number between 0-100 where 100 is the perfect score. How is dental score calculated? Dental score indicates how good one’s oral health is. When you come to our office your dentist will do a comprehensive oral exam. She goes through all of the major and minor issues and will take notes and register that information in our internal system. Impact score is a number between 1-10 that shows how important a specific procedure is for one’s oral health. For example, doing a cosmetic procedure is not as important as taking care of a tooth that requires a root-canal. After assigning an impact score to each procedure, we look into the relations between these procedures. For example, if you haven’t been to a dental office for a while and we know that you still have unscheduled work, the importance of that work can potentially increase over time. A filling that was supposed to be done 2 years ago, can turn into a root-canal if you don’t take care of it. As a part of the dental score we also look into what work you already have scheduled to be done in the future. So, if you are in the middle of taking care of major issues, your score will show that. We are also using statistical metrics and models to predict the chance of one’s score changing based on what we know about each patient and what we have seen in other patients who have a similar profile. 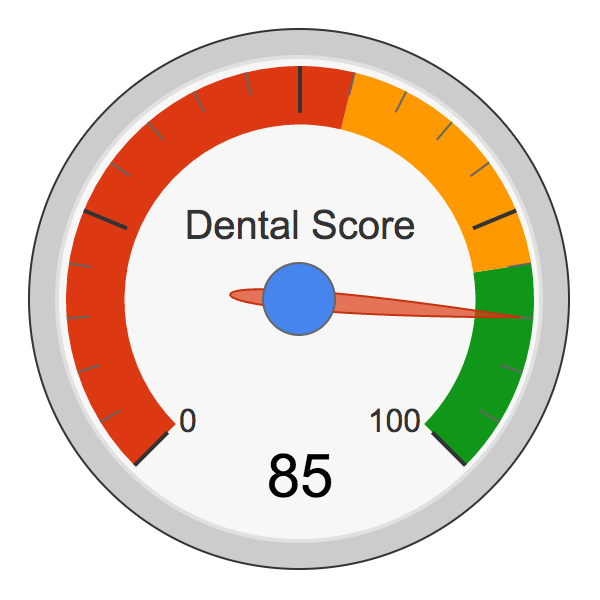 As a rule of thumb, 80+ is considered a good score while 95+ shows excellent oral health. Scores lower than 80 require attention to avoid falling in the dangerous zone of 55 and lower. Want your dental score? Book your dental appointment and come in for an exam.